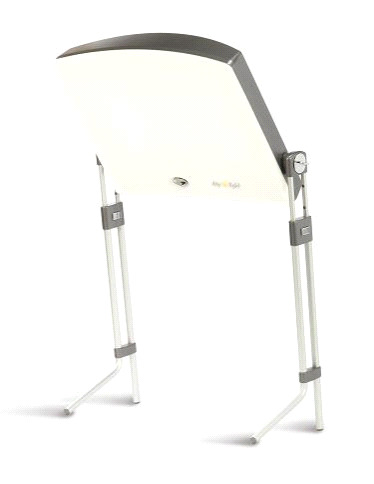 Uplift Bright Light Therapy System. Day-Light now comes with unique modern colour enhancements along with silver coded buttons and height adjustable legs that provides an aesthetically pleasing appearance while delivering optimal light therapy. This the model DL930 and it retails for $224.99. Safe, effective, and now more affordable than ever. The new Day-Light™ merges the principles of the company’s distinctive light technology standards, with a new and innovative design – all at an affordable new price. The New Day-Light is a specially designed 10,000 lux* bright light system, used by many people to help ease seasonal mood swings and regulate body rhythms. To receive the recommended light therapy dosage, users simply sit 12" from the light for 20-30 minute intervals daily. *Lux is the level of illumination of light.